Our incredible 2014 Chevrolet Silverado 1500 Crew Cab LT 4x4 shown off in a lustrous Blue Topaz Metallic. Powered by a Direct Injected 5.3 Liter EcoTec3 V8 that offers 355hp while connected to a reliable 6 Speed Automatic transmission. 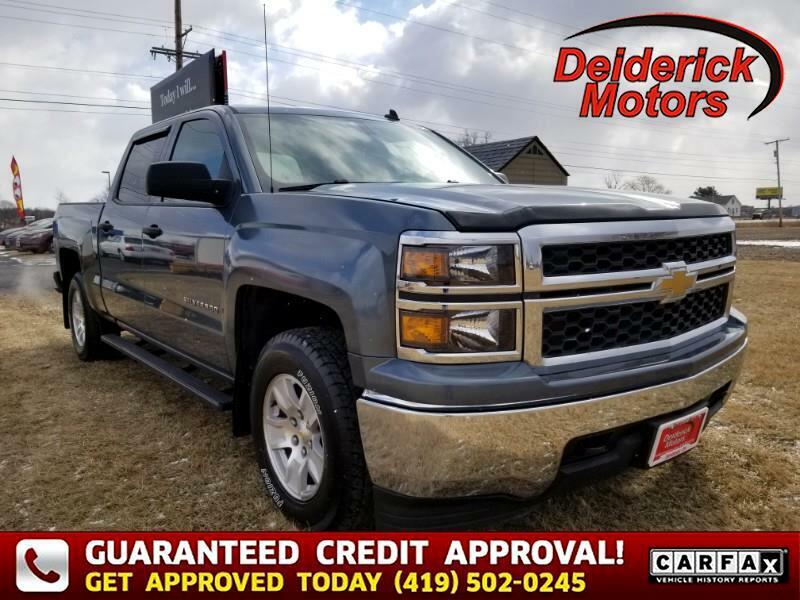 Muddy rural roads, mountain terrain, towing your boat, or hauling lumber are no challenge for our Four Wheel Drive Silverado that offers near 23mpg. The beefy front suspension eases you down the road in comfort while the rear set up is sturdy enough to keep up with your demanding life. We specialize in helping customers in ALL credit situations. Whether you have perfect credit or are recovering from a situational credit problem, Deiderick Motors vast array of lender programs can help you out. Call us at 419-502-0245 TODAY to schedule your test drive. Or feel free to browse our inventory, fill out a credit application and set up an appointment. By the time you arrive, we'll have assessed your situation and have a solution ready!